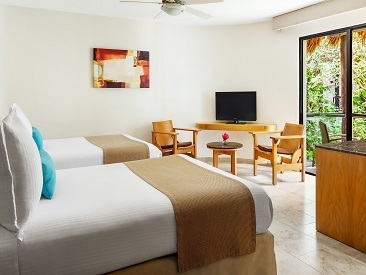 The Reef Playacar is a moderately sized, socially-interactive, all-inclusive, Vacation Express Favorite beachfront resort, located in beautiful Playa del Carmen. Guests will find Mexican Caribbean architecture amidst lush tropical gardens, winding paths, two spectacular freeform pools and picturesque shade palapas. 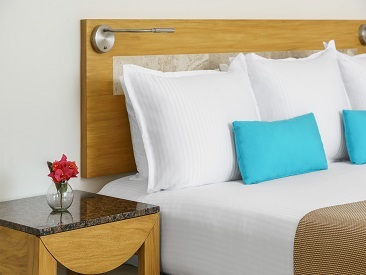 An active, but very laid-back resort, The Reef Playacar is great for singles, couples and families looking for a variety of activities and resort amenities that can be enjoyed in a relaxed Caribbean state of mind. 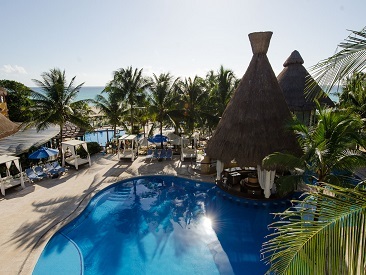 The Reef Playacar is a moderate-size, socially interactive all-inclusive beachfront resort. You will find Mexican Caribbean architecture amidst lush tropical gardens, winding paths, two spectacular freeform pools and picturesque shade palapas. An active yet very laid-back resort, just a short walk from the charming town of Playa del Carmen, The Reef Playacar is great for singles, couples, and families looking for a variety of activities and resort amenities that can be enjoyed in a relaxed Caribbean state of mind. One à la carte dinner option in the Italian à la carte restaurant, "Botticelli"
For only $18 per day you can drink the best international top brands drinks all day. Also, includes free access to The Nico's Lounge Bar and Terraza Grill. Absolute Vodka, Bacardi Rum, Baileys, Cointreaux, Gran Marnier, Jack Daniels, Don Julio Tequila and more! Please Note: Due to environmental factors and natural erosion beach size is susceptible to constant change and may vary seasonally.